John Kenneth Muir's Reflections on Cult Movies and Classic TV: Special Thanks; and a Blogathon comes to an end! Joe Maddrey and I want to heartily thank everyone who participated in this week's amazing Blogathon. It's been a blast for the two of us, and we hope you enjoyed reading all the wonderful posts about Mr. Henriksen and his diverse career. I would like to say a warm "job well done" and thanks to Joe, who has been a real and valuable partner through this process. I've known Joe for six years now (hard to believe), and every time we get to work together on a project it's a true pleasure. 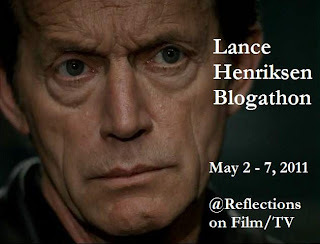 Joe and I also want to thank the one-and-only Mr. Lance Henriksen for proving such a rich source of inspiration to so many folks. It's been amazing and very rewarding to see how deeply he's affected different viewers, and for what roles, in particular, this has been the case. Last, but never, ever least, a special word of appreciation and gratitude goes out to all the hard-working participants in the Blogathon. Bravo!!! Congrats to both of you for successfully bringing off this celebration for the one and only Lance Henriksen. It was awesome. Heartfelt thanks to all. Thank you, Michael, for your excellent contributions to the blogathon this week. You gave us some wonderful reading (and I'm still thinking about Bishop vs. Rafe...). It was an honor and pleasure to be part of it. Congratulations on a fun week focused on this fine actor. Some terrific work all around.